It's been a little while since I've stumbled across a dupe in my collection. Generally, to fight my hoarding tendencies, I avoid buying things I have a probable dupe for until I can research the item further...because there are usually differences that make it so I can either live without or wait for a good sale. 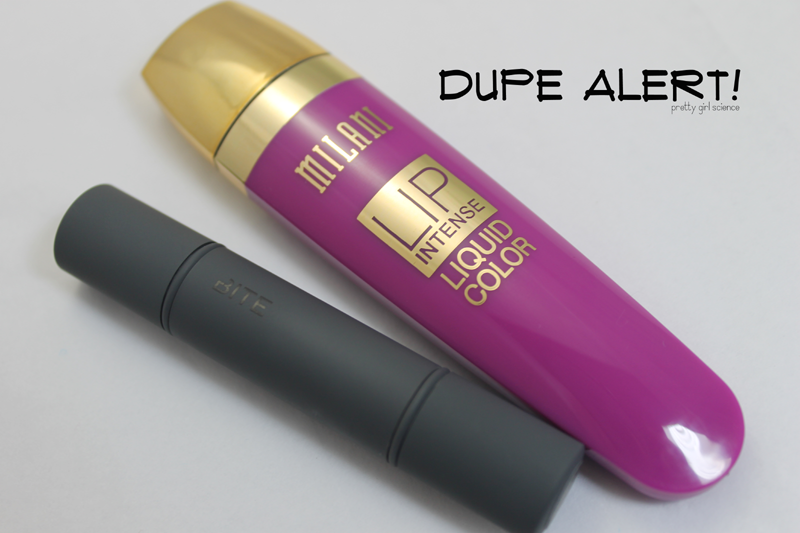 I figured that the Milani liquid lipstick would have a fair number of dupes, but a buy one, get one half off sale forced my hand and I bought it at first glance. 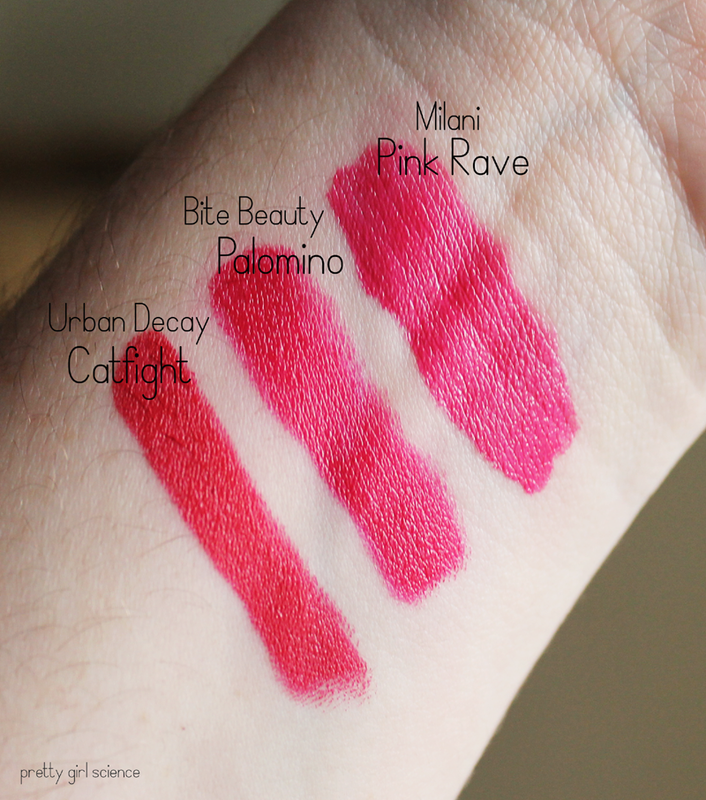 Turns out it is (color wise) a dupe for another beloved lip product! Both colors have the same deep electric feel to them. 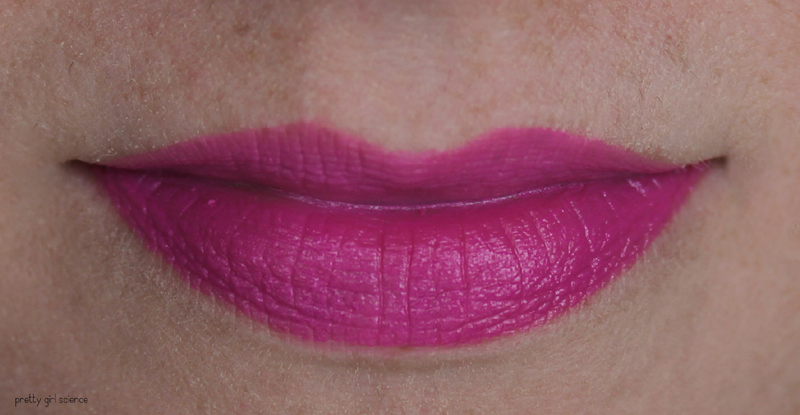 There is a cool pinky-violet shade here that I really love against my skin tone. They are both creamy, apply beautifully, and wear well without much feathering. 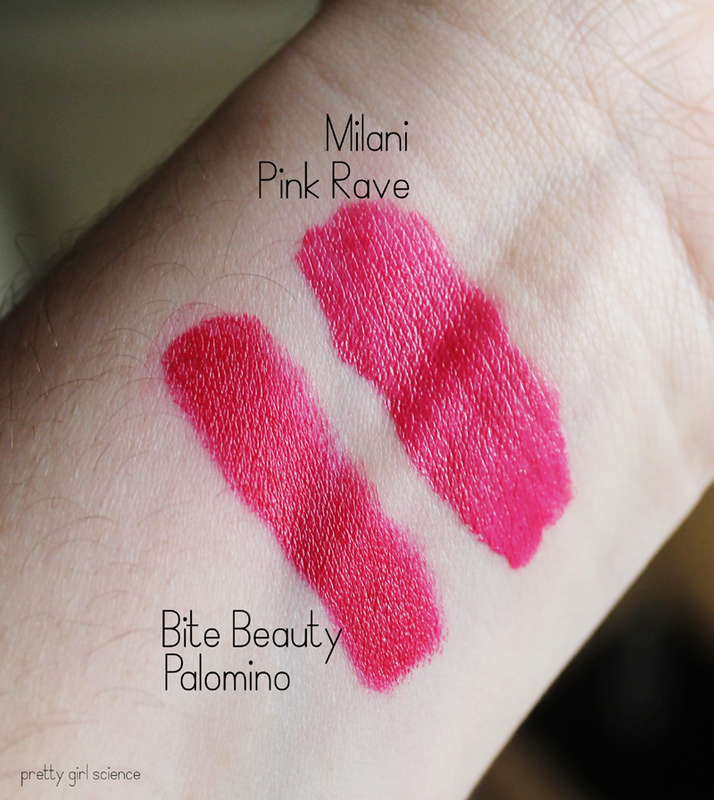 The Milani has a texture akin to the Nyx Soft Matte lip creams...but with a satiny finish. They apply quite smoothly, though they definitely need a second layer and/or lip liner to give you that bam!pow! color payoff. The Bite Beauty, on the other hand, is a proper lipstick. One swipe will give you a full punch of color, with or without a liner. The wear time on the Milani doesn't compare to the Bite lipstick. It wears a little like a gloss...losing a fair amount of the color and shine after an hour or so. You will still have a faint stain to your lips, but that is about it. The Bite lipstick lasts and lasts. Even as is fades, you are still left with a vibrant pinky-violet stain. The Bite has a very sweet, almost artificial scent. It isn't bad, but it is definitely memorable and unique. The Milani has a slightly buttery/sweet scent that reminds me of something I can't quite put my finger on...Neither smell is off-putting, and I personally don't notice it after a while. For the little Bite duo I have, it is $12 from Sephora. For a full size, it is $24. The Milani retails for around $7, depending on where you find it. Since I grabbed two of the Milani liquid lipsticks, I decided to compare the other end of my litter duo to the Pink Rave color I grabbed. 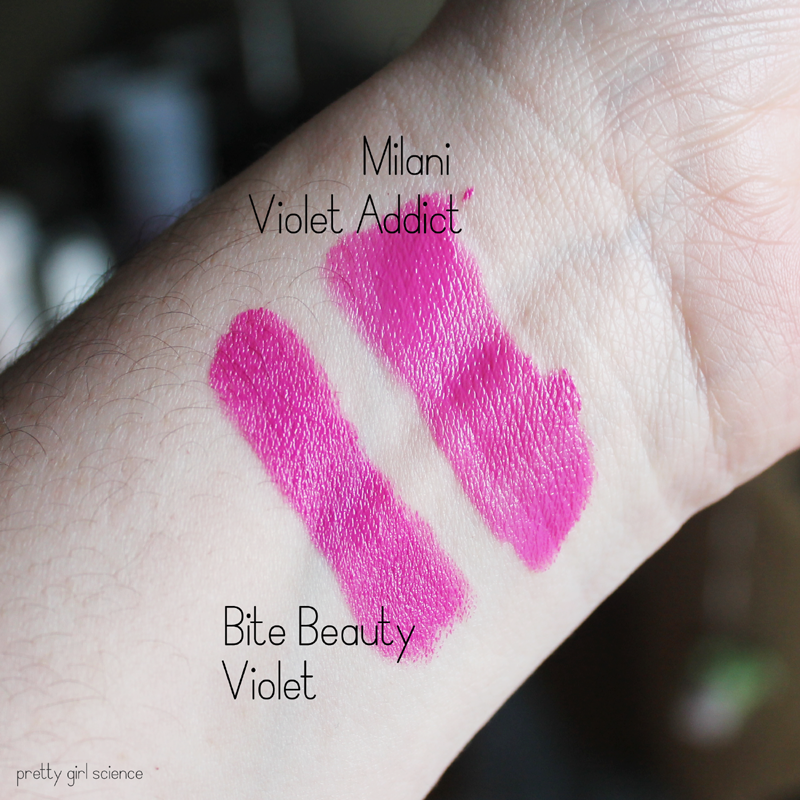 I found the two colors to be pretty similar, though not quite as close as Violet Addict and Violet. Palomino has a slightly warmer tone to it, especially when up against Pink Rave.